The successful demonstration of remote-controlled “drones-bees” by Netherlands’ Delft University of Technology (TU Delft) has been making news since Tuesday. But the buzz surrounding the drone’s applications could be much hyped, according to at least two independent estimates by biologists. Many popular news websites reported that the university’s drone-bees could successfully replace real bees in pollination if they go extinct, but this might be optimistic. First, it’s not economically feasible to mass produce the robot insects. Second, there’s a flaw in understanding the science of pollination. The Netherlands is one of the largest exporters of food and agricultural products in the world. While bees continue to pollinate 80 per cent of edible crops grown there, their population is under constant threat from pesticides. Some experts warn that all 360 species of bees in the country are endangered. Enter the drones developed by TU Delft researchers. The robot bees have a wingspan of 33 cm, weigh 29 grams, can flap their wings 17 times per second, and generate enough lift to stay airborne. They control their flight by making minor adjustments in the wing motion. 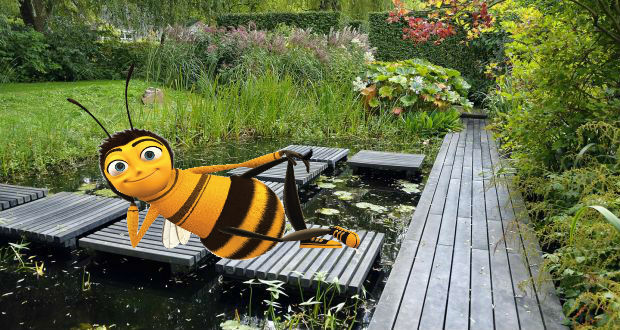 The university’s press release states that these features allow the drone bees to hover on the spot, and to fly in any direction. But they are not quite the same as actual bees. The Guardian reported that the robotic insect can only fly for six minutes, or 1 kilometer (0.6 mile) on its current battery. They’re also about 15 times larger than actual bees, although the university plans to cut the size down in the future. Speaking to the Telegraph, Matěj Karásek, a researcher working on the project said “The goal is to have a device that could pollinate flowers as it may be that bees will die out…if you can imagine a swarm of these robots flying around a warehouse or greenhouse, they would very safe to work around as they are so small and light.” He added that they hope to eventually mass produce the drone so that it can be used worldwide. While the drone bees are indeed futuristic, using them for large scale pollination may not be a reality anytime soon. First, manufacturing these robots on a scale large enough to replace real life bees may not be an effective solution. While I can see the intellectual interest in trying to create robotic bees, I would argue that it is exceedingly unlikely that we could ever produce something as cheap or as effective as bees themselves… Consider just the numbers; there are roughly 80 million honeybee hives in the world, each containing perhaps 40,000 bees through the spring and summer. That adds up to 3.2 trillion bees. They feed themselves for free, breed for free, and even give us honey as a bonus. What would the cost be of replacing them with robots? Even if we cut down on ambition, and go by the words of Karásek that the drone-bees can help in pollination within greenhouses, there’s another major hurdle – botany. Successful pollination often depends on where the pollinator visited beforehand: pollen from other plant species can reduce pollination success, pollen from other varieties of the same plant species can affect pollination in different ways, and bacteria or fungi that naturally live in the nectar of other flowers can affect reproduction of another flower. Managing these natural interactions is beyond the scope of a drone. Saunders added that many crops require multiple visits by different types of pollinators (insects, animals, birds etc.). Only with multiple attempts, she noted, there is a chance of the right pollen successfully fertilizing the flower to produce fruits or seeds. Sometimes there can even be developmental deformities in fruits and vegetables if pollination isn’t done right. There are hoards of questions still puzzling biologists about pollination, she added: the time an insect has to spend on each flower; their most suited physical behavior on the flower; the optimal number of pollen grains they must carry; the best time of the day for pollination; the ideal temperature and humidity for pollination, and so on. Additionally, every plant species has unique flower types, and each of these are tuned for successful pollination with different insect species. In many cases, the flowers and their pollinators have gone through millions of years of coordinated evolution, and in the process have become mutually optimal for pollination. Drones may not just be able to break into this well choreographed dance of co-evolution. Saunders concluded that drone projects aiming to mimic bees could be fun to work on, but not as practical solutions to large scale pollination. These pollination drones will be fun toys, and they could also be useful educational tools. They might even be destined for a life on Mars. But, no fear, they wouldn’t last long on most farms on Earth. It must also be noted that neither the research paper published on the drone project, the project’s official website, nor the press release from Delft University of Technology mentions the potential use of the drones as pollinators. And there’s another problem: with false hypes like these, farmers and policy makers might stop worrying about harming bees with insecticides. This may cause the bee population to decline further. So when it comes to finding solutions for pollination, conserving bees is still our best bet.